Get ready for Arc 2 of My Hero Academia Season 2. Plus Ultra! 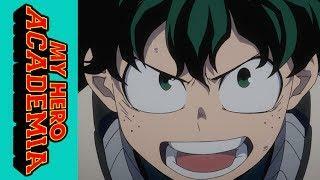 Go to funimation.com/myheroclass for all updates and new episodes. Now that the sports festival is over, it’s time for internships with real pros! And who better to train Izuku than the man who trained All Might? But villains are stirring once again in Hosu City, where Iida seeks to avenge his brother. Izuku’s friends are in danger, and together they’ll kick it up a notch to fight alongside ace heroes.